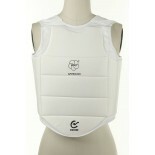 Made of vinyl, lined with durable foam rubber and shock absorbing materials. Finger slots offer better stability to resist strikes. Sold individually. 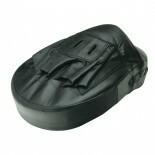 ONE SIZE COLOR: BLACK ..
Dual foam padded section for additional sound effect upon impact. Wristband secured by velcro. Sold individually. 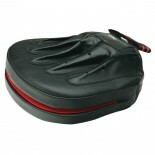 ONE SIZE Color: Black ..
Made of leather, lined with durable foam rubber and shock absorbing materials. Finger slots offer better stability to resist strikes. Sold individually. ONE SIZE Color: Black ..
Curved design enhances the ability to absorb punches in an anatomically correct hand position for the trainer. Small surface area helps develop precision timing and sharpens speed combinations for users. 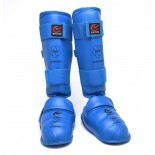 Made of super dense, shock absorbing foam for increased protection of the hands and wrists. Sold in pairs. 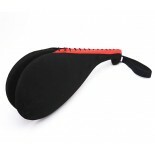 ONE SIZE Color: Black ..
Lightweight yet durable, our paddles are the perfect size at 7.5” x 15”. Comfortable wrist strap. Single blade. 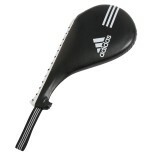 COLOR: BLACK ..
Lightweight yet durable, our paddles are the perfect size at 7.5” x 15”. Comfortable wrist strap. The double target creates a loud clapping sound to indicate an accurate strike. 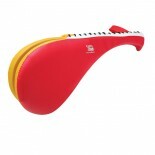 COLOR: BLACK, RED, BLUE ..
Lightweight yet durable, our paddles are the perfect size at 7.5” x 15”. Comfortable wrist strap. Genuine leather. The double target creates a loud clapping sound to indicate an accurate strike. 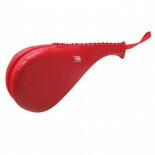 COLOR: RED ..
Lightweight yet durable, our paddles are the perfect size at 6” x 15”. Comfortable wrist strap. The double target creates a loud clapping sound to indicate an accurate strike. Junior size targets are available in bright colors. COLOR: RED, BLUE, GREEN ..
Lightweight yet durable, our paddles are the perfect size at 7.5” x 15”. Comfortable wrist strap. Synthetic Suede. The double target creates a loud clapping sound to indicate an accurate strike. COLOR: BLACK ..
Standard equipment for sparring, these training mitts offer real protecton when practicing high and low kicks. The elastic wristband ensures a secure fit. 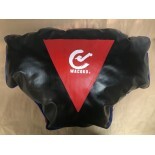 Color: Black Size: Small Material: Special vinyl, sponge ..